Molly O’Donaghue has photographed some of the most beautiful women in the world. For the last year she’s been living in Montana, building a business that keeps her feet on the ground and her heart intact. Sweet on You is the fourth book in The Bridesmaids Club series and can be read as a standalone. Each of Leeanna's series are linked so you can find out what happens to your favorite characters in other books. 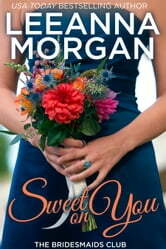 For information about new releases and giveaways, please visit leeannamorgan.com and sign up to my newsletter. Happy reading!